The following statement by Richard Hamilton is in response to the interview with John McHale Jr.
John McHale Jnr.’s claim that his father created my 1956 collage ‘Just what is it that makes today’s homes so different, so appealing?’ by sending instructions from Yale, where he had been awarded a grant to study squares with Joseph Albers, is absurd. The collage has been widely reproduced over the last fifty years and my authorship was never, to my knowledge, contested by John McHale Snr. when he was alive. Each of the twelve exhibiting groups was asked to contribute six pages to be included in the This is Tomorrow exhibition catalogue. I thought that it would be appropriate for each of us to design two pages of the six allocated to us. As it happened John Voelcker had completed his fantastic structure and was busy on other things so he was happy to leave the graphic design to me. Working with John Voelcker was a dream collaboration but trying to work with McHale was a nightmare. 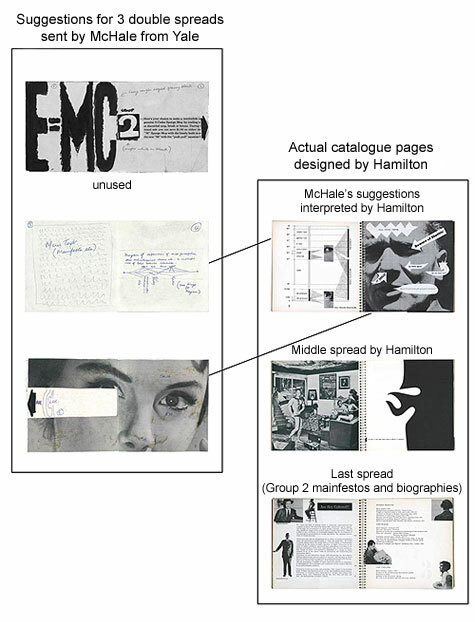 He sent me a rough layout for all six catalogue pages. The final design was executed by me. I took two of his ideas and reinterpreted them for the first two pages but there was no time to gain his approval. Two further pages were entirely my own, without any consultation with McHale. My spread showed a classic optical illusion and a collage. The last spread (also designed by me) contained text; a paragraph written by me, two from McHale, and and one from Voelcker opposite a page of biographies. I spent a morning making the collage at the home of Magda and Frank Cordell, where John McHale lodged when in London. My wife Terry O’Reilly and Magda Cordell assisted in the role of picture researchers. Their task was to scour the stacks of American Magazines (Life, Look, Good Housekeeping, Scientific American, etc.,) with which the Cordell household was well provided, seeking photographs to represent subjects I had listed the day before. Given the constraint that each item had to be fitted into an evolving perspective scheme a great many clippings were offered for selection. When clearing up the mess of trimmings on the floor, I picked up a strip of paper printed with the words ‘Just what is it that makes today’s homes so different, so appealing?’ – it seemed heaven-sent. I stuck what had been a caption for some picture past recall beneath the completed image as the title. Each group was then asked to design and print a poster. With the absence of McHale causing long delays in communication, I used my catalogue image for Group 2's contribution to the posters. John McHale Jnr.’s delusions may be an unfortunate consequence of John McHale Snr.’s dislike of my collage image and his insistence that a poster of his own be added to the series, despite the fact that only one design was requested from each group. I executed McHale’s sketch design of arrows and spirals sent to me from New Haven. McHale’s poster was silkscreened, in black and red, by me. I made the screens and squeegeed the ink in the Textile Department of Newcastle University, It was properly credited to McHale and I had no wish to be associated with it, I thought I was doing him a favour. The two posters should not be confused. This is well documented with letters sent by McHale from Yale. 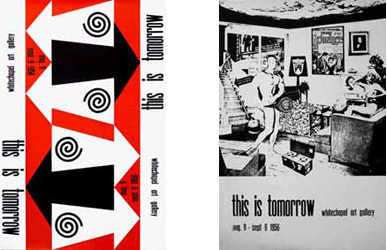 They have been sitting in a folder marked 'This is Tomorrow' for the last fifty years.